Italy continues to be a favorite destination for Europe bound Americans. And why not? You will eat well, drink well (cafe & vino), enjoy beautiful panoramic views and scenery, inspirational architecture, historic sights, incredible museums, fashion, diverse culture, and welcoming locals. Living in a rental villa gives one the opportunity to live like a local, shop where the locals shop, and truly immerse yourself in the culture. Unpack once, cook when you like or enjoy the vast variety of local restaurants, have a chef come into your ‘home’ for a cooking lesson, and dine on the results. Day trip to surrounding towns, wineries, shops, and galleries on your own schedule or not. As many Americans are already planning their holiday shopping strategy, I am wishing I could be working on my ‘gift list’ in the Mercatino di Natale in Italy. Milan hosts a Wonderland Village in the historic center from early December through January 6 with a market, ice-skating rink, and entertainment. 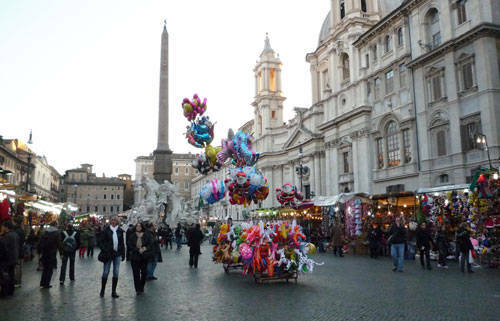 Rome’s Piazza Navona hosts a big Christmas Market. Babbo Natale, Father Christmas, makes appearances for picture taking opportunities and there is a life-size nativity scene set up in the piazza later in the month. Lucca, in Tuscany, holds a Christmas market in Piazza San Michele, usually through December 26. 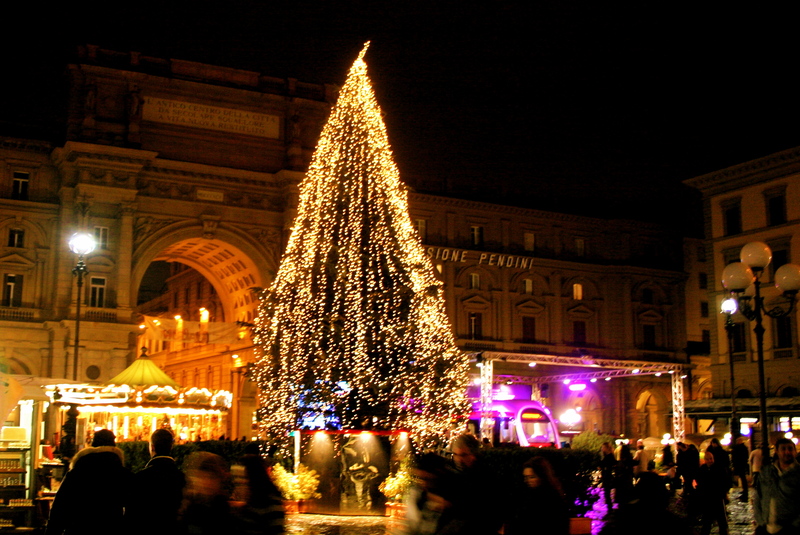 Siena holds several Christmas markets during December as does Arezzo, Montepulciano, and Pisa. Florence Noel starts at the end of November. Children can visit the house of Babbo Natale (Father Christmas), there’s a Christmas market with colorful lights displays. Also in Florence, Piazza Santa Croce holds a popular German-style Christmas market consisting of many booths from the end of November through mid-December. Naples holds a December Christmas market near Via San Gregorio Armeno, known for its many nativity workshops. Some of the vendors dress in traditional shepherd costumes. Nearby Sorrento, on the beautiful Amalfi peninsula in the Bay of Naples holds it’s market in Tassi Square through January 6. Wherever you are doing your holiday shopping, I wish you a a Buone Feste ! 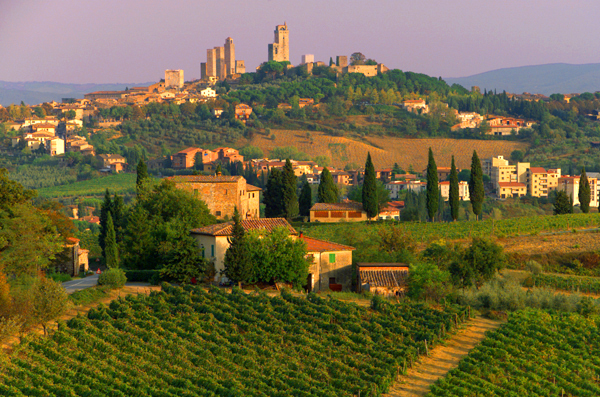 A ‘WOW’ experience in the heart of Tuscany! Spend the day with a top notch wine maker in his Chianti cellar tasting and blending your very own personal vintage. The barriques of Sangiovese, Merlot, Cabernet Sauvignon, Gamay, and Syrah that you will use for blending your wine, come from the vines on the 150 acre estate. Your local oenologist will coach and guide you, with his 20 plus years experience, to assure a memorable wine. After a lunch break in this historic castle, you will bottle the wine which will be delivered to your home two months later. Of course, you will have designed your own personal label for your private bottling. Though I did not have a full day to blend my own vintage, I can assure you that my recent tour of this historic Chianti winery, followed by an intimate wine-paired five course lunch, was one of my most memorable Tuscany experiences. Aside from having your own personal vintage wine, adorned with your unique label, the opportunity to understand the blending process with an expert is a very special event ! Verdura Golf and Spa Resort located on the scenic northwest coast of Sicily is an ideal destination to chill out from the the hustle bustle of Palermo. This low-rise Rocco Forte resort is on more than 500 acres with an extensive private beach. Most rooms have sea views, due to the low-rise buildings and expansive grounds. The resort boasts 45 holes of golf and I can attest to the fact that the course is championship quality, having recently played the North Course. Dining options are plentiful and each offer a unique atmosphere with both indoor and al fresco options. The Verdura guest rooms are exceptionally large and all have either a balcony or terrace. For the non-golfers, Verdura has a tennis center with 6 lighted courts, allowing night time play, an enormous infinity pool, an extensive spa with another swim pool, a series of thalasso treatment pools, a gym, and sauna. For the beach goers, all the chaises, umbrellas, towels, water sports equipment, and beach front restaurant make for an ideal day at the beach. Complimentary bicycles are all over the property, just waiting for guests to snag one for use during their stay, which I thought was a very nice touch. To my surprise, there is a dedicated children’s center, proof that Verdura welcomes families. Want a diversion, about 30 minutes south of Verdura is one of the best preserved Greek Temples in the world at Agrigento…The Valley of the Temples. Not to be missed is an excellent Archeological Museum, with well displayed artifacts found during the excavations. After a few days at Verdura, one can drive along the southern coast to Siracusa, preferably with a few overnights inland and then up to Taormina before departing from Catania. Upon disembarking from the Windsurf, I made my fourth visit to Barcelona and it continues to entice me – bubbling with life in its narrow pedestrian only street, the grand boulevards, the parks and placas (squares), the chic neighborhoods..both new and old, the shopping, and of course the cuisine, including the tapas. Many visitors either begin or end their visit to Barcelona at the port – as it is a convenient and modern Mediterranean port that has a long maritime history. The 200-foot-tall Columbus Monument greets you at the ports roundabout that was built for an exposition in 1888. It was in Barcelona that Ferdinand and Isabel welcomed Columbus home after his first trip to America. Highlights include Gaudi’s remarkable cathedral, the Sagrada Familia, which was recently consecrated by Pope Benedict with incredible service and grand celebration. Though works continues, the interior is finished and awe-inspiring. The colossal Gothic Cathedral of Barcelona is also impressive and the Placa de la Seu is surrounded by inviting outdoor cafes that offer a splendid view of the Cathedral. Strolling the famous Rambles is a must – the pedestrian thoroughfare goes to the port and is both colorful and gritty filled with street vendors selling gelato, flowers, books, arts and crafts and the mimes are exceptional. Don’t miss La Boqueria, the lively produce market, surrounded by cafes and bars. Inland from Marbella and Malaga about an hour by car, Ronda is a charming gorge-straddling hill town of about 35,000 residents. It dates to the Moors and was taken back by the Spaniards in 1485. Ronda is the cradle of modern bullfighting and the home of the 19th century bandoleros. The two tiered bullring was built in 1785 and is a true show piece, complete with 136 Tuscan columns and a fascinating exhibit glorifying the sport. The lovely Ronda Parador Hotel is perched on the rim of the gorge and adjacent to the bridge that joins the old historic center and the new. The city is very pedestrian friendly and well tended by the locals. Balconies are brimming with flowers and the cafes and shops are very welcoming throughout the old and new town. Ronda is well worth the trip inland from the coast. On a side note, the route from Malaga to Ronda, passes the highly secured test track for the Formula One race cars.